Strange things are afoot here in New York. Last I checked, the calendar did say it was September...am I right? temperatures in the 90s with high humidity. seldom in August, never in September. (unless maybe you have a heated pool). and Summer is holding on. Like I said, strange things are afoot here in New York. despite this unseasonable weather we're having. Today I'm going to show you the dining room hutch. I've seen in blogland. They are really very lovely! Unfortunately, you won't see them here. I just don't think I'm a "subtle fall girl." in your face kind of girl." stuff I already had. Nothing is new. a nice for a change. "in your face Fall girl"? in your face kind of girl" atop your Dining Room hutch, dear friend!!! but I'm going "all out" with vibrant rich hues in our lower level!!! "In your face" fall girl, here. I love Fall. And I love your dining room hutch. I can almost smell the cinnamon and apples from this side of the world. I always think you have a home for Spring freshness and Summer Joy but then you go and welcome another season and it suits just RIGHT. I love the sign. Yes. I'm more subtle for Fall. I decorate very little. My daughter in law goes all out with candles in every room and decor in every corner. I love it though. It's my favorite time of year, the sights, the smells, the change. Feels like starting over, but with lots of thinking and considering and memories that come with the season of change. Haha, someone our posts are similar, yet different. It is summertime hot here, too and, well, I am easing into it, haha. Love your mantle, always do enjoy your posts, sweet friend. Hugs. Well, I'm an 'in your face', kinda gal anyway, and Fall is just made for a riot of color!!! No white, baby pinks, soft blues, pale summer and spring colors for me. 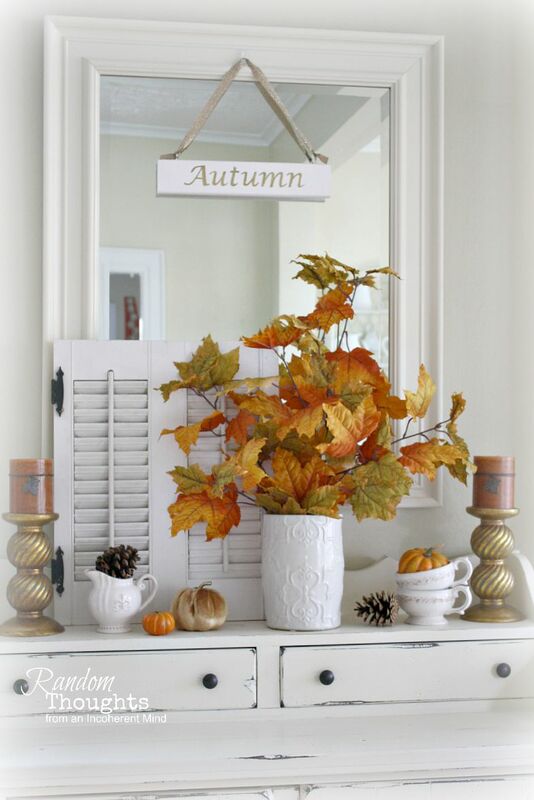 Can't wait for the changing leaves and grasses, reds, oranges, gold and purples........bring it on!!! Hi Gina, such a lovely look! Love the white cabinet and how crisp everything looks. The fall leaves look fabulous. 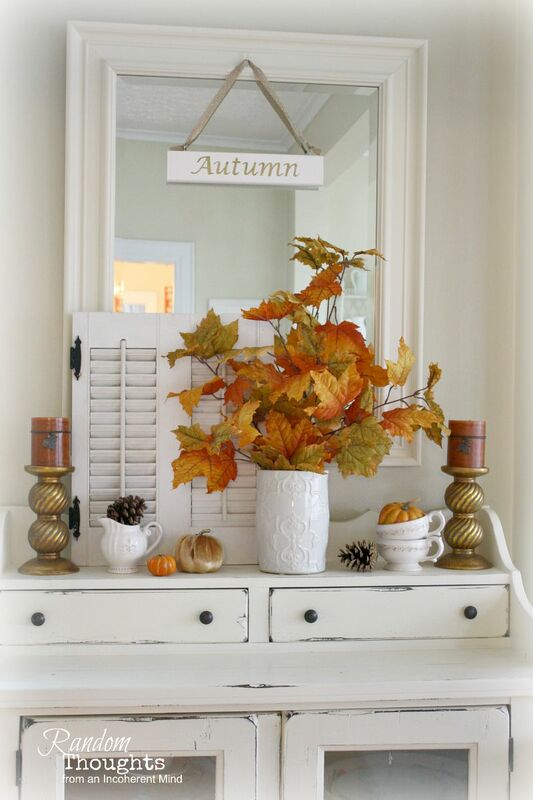 I really like your fall display on your hutch. The bright happy colors do add a sense of warmth as well. I don't use a lot of the traditional fall colors like oranges and yellows, but I do like to bring out more stuff that sets a warm tone in anticipation of cooler temperatures. Gina, your hutch looks so pretty! You did a great job incorporating fall colors but it all still looks like you. Did I tell you that I came to New York a month ago? Visited my girlfriend in Fairport. Mercy, I love it there!! Yep.. 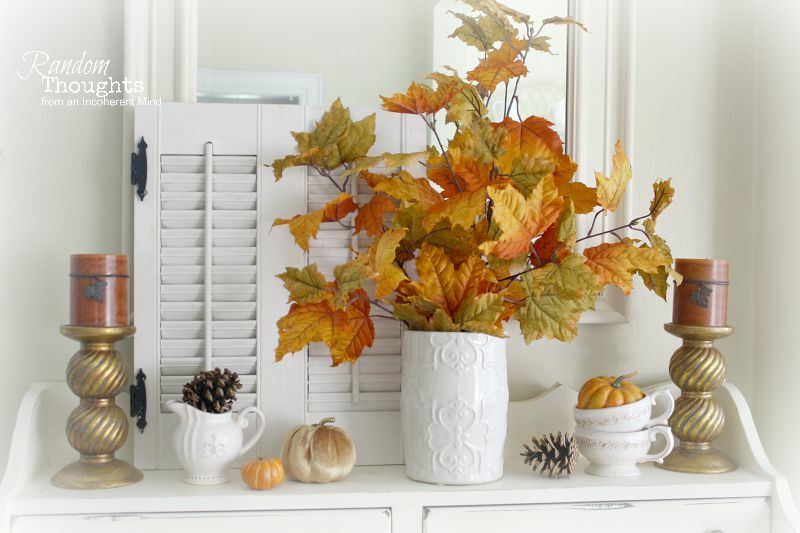 I love Fall, and decorate with layers and layers of Fall colors and textures. However, this year I'm waiting for Oct. to put out the pumpkins.... for now, it's sunflowers, leaves, apples, etc..
As always, everything at your home is darling! I am a totally in your face Fall girl lol! Your decor is looking lovely as always Gina! Enjoy the season. Love this Gina! I'm somewhere between "in your face" and "subtle" LOL! Your Fall decor is so pretty.....I really like the contrast between the beautiful, rich colors of Fall and all of the white. It truly is stunning! I am a VERY in your face kinda' girl....the more color the better I like it!! !